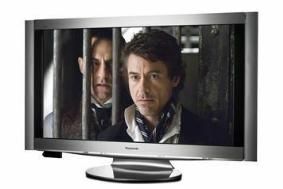 Ofcom clears the way for first wireless HD TVs | What Hi-Fi? Any manufacturer of devices that use wireless technology needs permission from Ofcom to use the relevant part of the radio spectrum. From the end of this week, Ofcom will release a small part of the spectrum, 57 Gigahertz to 66 Gigahertz, to be used by consumer electronics manufacturers. Panasonic will be the first to launch wireless TVs using the new radio spectrum. Its flagship Z1 models have a wireless transmitter that plugs into your set-top box or Blu-ray/DVD player and transmits the picture and sound to a small receiver clipped on to the TV. Steve Lucas of Panasonic says: "The advantage of this high radio frequency is that you can send a lot of high-definition information from the transmitter to the TV without the need to compress it. There will be no break-up of the picture." You can read our full review of the Panasonic TX-P46Z1 here.